We've been slacking a little on our Saturday lunch tradition, what with heading out to the beach one Saturday and returning the next Saturday. So...Sunday dinner was the mostly local meal this week. 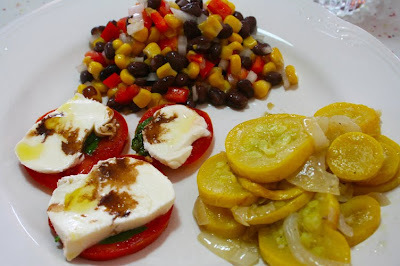 Since the heat has been extraordinarily oppressive here as of late, I decided to make various favorite summer salads. It's just hard to hover over a stove or oven when it's around 100° outside. 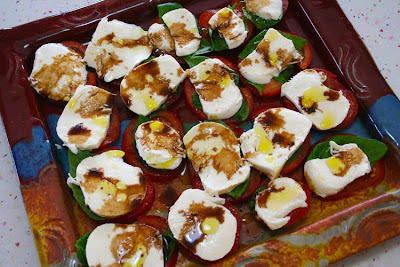 We came home to an overgrowth of basil in our yard which made tomato-mozzarella salad an easy choice to start our meal. 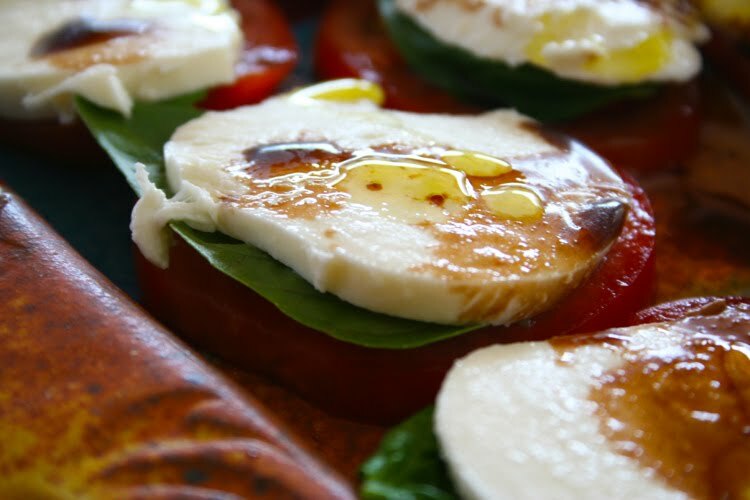 We especially love it with slightly coarse sea salt and a drizzle of balsamic vinegar and olive oil. The textures just blend so marvelously. Another go-to summer salad for us is Black Bean Salad. Two cups of cooked black beans, two cups of blanched, then cut from the cob, corn, with one medium bell pepper diced and a quarter cup of finely diced onion mixed with 2-3 tbsp of each olive oil and red wine vinegar then sprinkled with sea salt and pepper to taste. Very easy and tasty summer treat! Another dish, that's not exactly a salad but will use up your plethora of summer squash, is this side that's essentially pan-fried squash. Slice 4 small-medium sized squash (you want it on the smallish side so it's not too wide or seedy) into about 1/4-1/3 inch slices. Half (from top to bottom) and peel 1-2 yellow onions slicing each half in about the same width as the squash. Heat a cast iron skillet over medium heat with 2-3 tbsp olive oil. Place the squash and onions in the heated pan with 3 cloves of minced garlic and 1/2 tsp salt and a fair amount of freshly ground pepper. Stir every couple of minutes until the onions are starting to turn clear and the squash is starting to soften. Turn off heat, cover dish and leave for about 5 minutes. Turn out pan-fried squash into bowl and wait another 5-10 minutes. When I'm eating this with salads, I like for it to be closer to room temperature than piping hot. 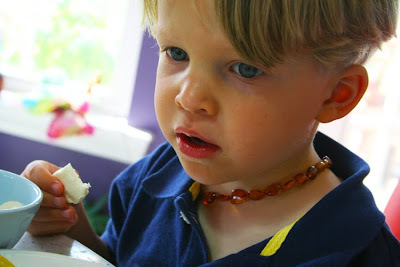 Finn prefers his mozzarella sans balsamic vinegar. His tongue hasn't quite developed to appreciate the sour yet. But it's quite a tasty plate of "Saturday lunch" food, if I do say so myself. 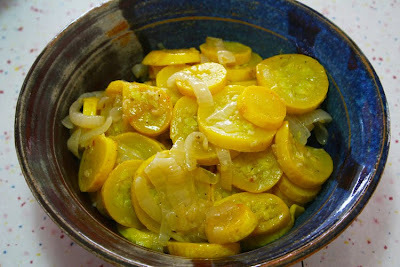 Mmmm...the fried squash and onions is one of our family favorites too! If you keep this yummy food posting up I am going to show up on your doorstep with an empty plate. My kind of meal! I ate tomato salad every single summer day of both pregnancies, and Grady will fight hard to steal it off my plate to this day. He calls is "sushi" for some reason. Everything looks incredible Joy, I will certainly be trying the tomato-mozzarella-basil salad! love tomato salad...&, you must add the bulghur wheat tabouli from Moosewood to your mix of salads if you haven't already. It's a winner. We had that same mozzarella/tomato salad last night-I was so excited to buy the first "real" tomatoes of the season on Saturday. Thanks so much for reminding me of black bean/corn salad. I have a really good recipe that I had forgotten about! 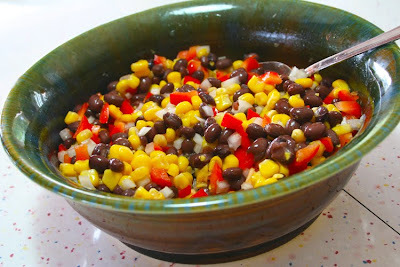 We're having that corn/black bean salad for dinner tonight! Oh, yummy. These all look great! And thanks for the yellow squash inspiration. We have SO much of it! Delicious.... Can't wait for summer. I want to grow tomatoes basil and corn. Mozzarella is my fav! Everything looks DELICIOUS!! Can you believe I was JUST looking up a salad/salsa recipe with black beans and corn? I kid you not...so thanks for the idea! I'm off to make that right now. YUM!